Like the previous post, here’s another underrated midwestern freakshow featured in the Horror Punk 101 countdown last Halloween. Lawrence, Kansas’ kings of reverb-drenched Cramps worship finally got pressed to wax—red wax no less—the perfect format for their brand of throwback garage stomp. And don’t assume that this is some showy retread tribute group dimly aping their heroes. 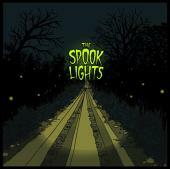 The Spook Lights craft an aesthetic that draws from and extends their influences, keeping them as relevant and vital as anything you’ll find seeping from the underground in 2010. This debut 7″ captures their outstanding track “Teenage Maniac” from the KJHK Farm Fresh compilation and backs it up with a slithering B-side, “Night of the Queerwolf”, packaged up in fine, screen-printed PBR case paperboard. Fans of Haunted George, Kid Congo, and of course The Cramps, take note. This entry was posted on Thursday, June 24th, 2010 at 12:27 am	and is filed under 2010s. You can follow any responses to this entry through the RSS 2.0 feed. You can leave a response, or trackback from your own site.